This post contains major spoilers for The Cloverfield Paradox and previous Cloverfield movies. Born from 2008's Cloverfield, resuscitated with 2016's 10 Cloverfield Lane, and expanded with the drop of the surprise Netflix original The Cloverfield Paradox, the "Cloververse" was never really meant to be a franchise. But for fans willing to play mastermind J.J. Abrams's game, there have been threads spun from the very beginning. Abrams and his production company, Bad Robot, famously love the "Mystery Box." Unpacked in his 2007 TED Talk, Abrams's story of being gifted a mystery box from the local magic shop as a child and neglecting to open it, realizing the excitement of possibility was more enthralling than whatever cheap knick-knack was inside, has become as well known as Hitchcock's 1939 lecture at Columbia University where he laid the narrative groundwork for the MacGuffin. The Cloverfield franchise -- named after the street the Bad Robot production offices are on -- is where Abrams's Mystery Box scheming collided with instinct to nurture up-and-coming directors. Like the particle accelerator experiment in Cloverfield Paradox, the resulting genre movies would spawn new worlds and possibility for sequels. The so-called Cloververse has connective tissue that largely seems added on top of each film's science-fiction premise. Fans of the anthology series use the online and viral marketing of each film to learn more about the Cloververse world(s) and, up until The Cloverfield Paradox, released Sunday after the Superbowl concluded, they had assumed the connection between Cloverfield and 10 Cloverfield Lane was merely in the realm of tonal similarities and easter eggs. They -- OK, we -- were wrong. The Cloverfield Paradox attempts to explain it all by explaining almost nothing that came before. There was a Mystery Box inside the Mystery Box the whole time. Here's how things line up. The Alternate Reality Game (ARG) marketing for the first Cloverfield movie included naming a Japanese parent company for the Slusho! Brand frozen drink. Slusho! Isn't a purely Cloververse easter egg, more of a Bad Robot calling card, with the first mention of the brand appearing in Alias. Cloverfield's ARG revealed that the Slusho drinks included a special ingredient called Seabed's Nector that umbrella company Tagruato was getting off the sea floor during their deep sea drilling operations. As the ARG and movie details tell us, the modern version of the company got its name from the fictional Kantaro Tagruato who founded a mining company called Hand of Power in 1945 on the southernmost island of Japan. The company did well and expanded into multiple types of plastics and aiding with the Japanese National Space Development Agency in the 1970s. By the 1980s, reports of child labor law violations and waste disposal misconduct drove founder Kantaro to suicide and all shares in the company were bought by engineer Ganu Yoshida, who changed the company's name to Tagruato in honor of the founder. Yoshida used Tagruato to expand his deep sea drilling program and also invented the recipe for Slusho. The company prospered and further diversified. The ARG for the first Cloverfield movie heavily suggested that the creature - nicknamed "Clover" - was discovered or awakened from the bottom of the ocean where Tagruato was mining for more seabed nectar. 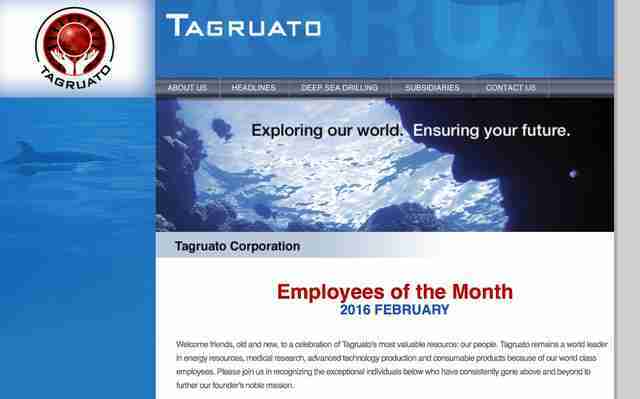 One of Tagruato's "drilling stations" in the Atlantic was destroyed in 2007, and the company blamed eco-terrorists T.I.D.O. Wave. Extra content on the Blu-ray revealed that the "mites" that fell off Clover had high concentrations of Seabed nectar in their blood. The first movie takes place in 2008 and the found footage device allows the attack of the Cloverfield monster to be occasionally interrupted by footage of the lead couple Rob and Beth at Coney Island on April 27th, a little less than a month before the attack. Their camera captures something falling from the sky into the Atlantic ocean, this is the piece of a Japanese satellite (we learned from a Tagruato press release from the old Tagruato.jp website). Was it the falling satellite piece that awoke the creature? Was it a Japanese energy company drilling for delicious food beverage ingredients? Turns out it was neither. Another subsidiary of Tagruato, Bold Futura "specializes in conceptualizing and creating new, bold technologies in the fields of military technology, arms development, and space exploration." Bold Futura's developments allowed Tagruato to dig deeper in the sea (for oil or seabed nectar) with technology able to withstand severe pressure conditions. Bold Futura also has two satellites in orbit around the Earth at any given time, but no one really knows where the satellites are located in orbit. 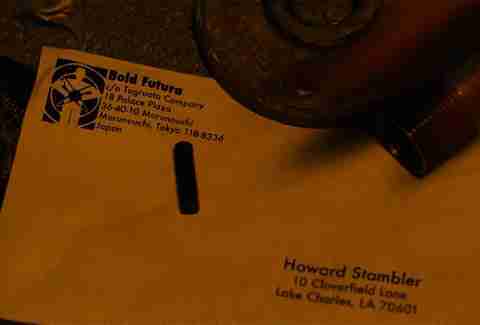 Howard Stambler (John Goodman) from 10 Cloverfield Lane, worked for Bold Futura for seven years, once even being named Employee of the Month. Sadly, Howard Stambler is a crazy person. After being left by his wife Denise and his daughter Megan, Howard kidnaps a girl named Brittany who looks vaguely like Megan and keeps her in a doomsday bunker until she tries to escape and he kills her. We learned in the ARG for 10 Cloverfield Lane that Howard Stambler had been in the Navy and worked on satellites for a project called SEASAT. During that project he and his colleagues saw something in space that their superiors forced them to cover up. Given the ending of 10 Cloverfield Lane, it's possible that he saw some sort of alien craft or extraterrestrial signals. Howard Stambler started working for Bold Futura in 2009 - what we assumed was one year after a giant monster attacked New York City. However, the events of Cloverfield are never mentioned in 10 Cloverfield Lane (which takes place in 2016), nor are the events of either previous film mentioned in The Cloverfield Paradox, which takes place in the near future. Was it aliens that Howard Stambler saw years ago in the Navy that drove him crazy, or was he a crazy person that happened to be working for Bold Futura on satellites when a real invasion began? Turns out neither. How does The Cloverfield Paradox connect to past movies? There are a lot of easter eggs in the newest Cloverfield that connect it to the long line of Bad Robot universe brands and names. There's a Slusho bobble head (like those given out over the summer for a brief ARG) on one of the station's control consoles; there are Tagruato logos on the equipment (noticeably a circuit box during the magnetic putty attack); there's even a Kelvin label near the hatch before Keil sacrifices himself (Kelvin was the surname of JJ Abrams's maternal grandfather, and a ship in the producer-director's reboot of Star Trek). Tagruato has begun development on a revolutionary new energy technology. In what Ceo Ganu Yoshida called a technological great leap forward for our planet/ This renewable technology will take at least 4 year to complete with along with another six years. International regulatory bodies to bring the powerful revolutionary energy source by April 18 2028. That places The Cloverfield Paradox in at least 2028, or two days short of ten years after the movie's planned release date. 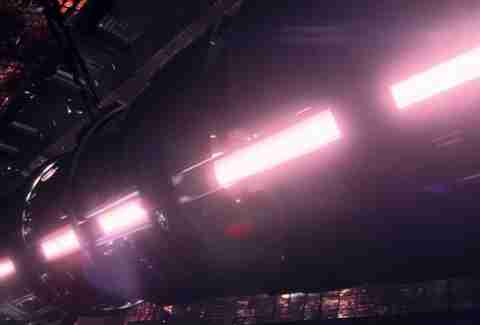 Either way, the film takes place in the future -- a near future -- in a world that is very much like ours, but with an energy crisis on. 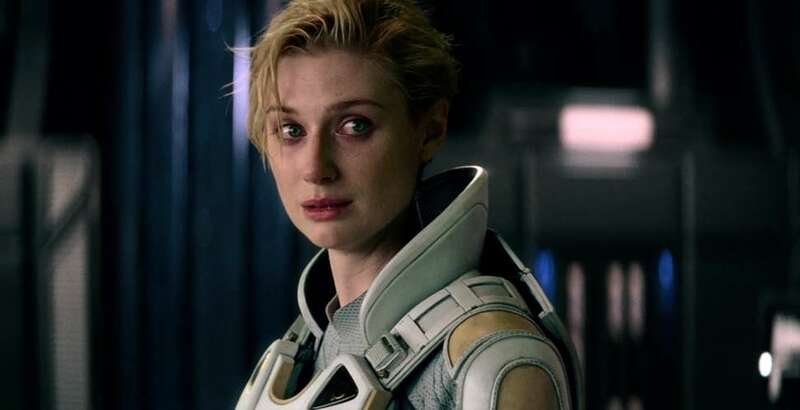 The crux of The Cloverfield Paradox's connection to the other two Cloverfield movies is in the short video clip of author and conspiracy theorist Mark Stambler (same surname as John Goodman's character from 10 Cloverfield Lane, who never mentioned having a brother and did not have a son) tells a television host (played by actress Suzanne Cryer, who also appears in 10 Cloverfield Lane): "Every time they test it, they risk ripping open the membrane of space time, smashing together multiple dimensions, shattering reality. And not just on that station: everywhere. This experiment could unleash chaos the likes of which we have never seen. Monsters, demons, beasts from the sea…"
Later Daniel Brul's German scientist states that the "Cloverfield paradox" is two dimensions particles interacting with each other. If the ad promoting the movie during the Superbowl is to be believed, The Cloverfield Paradox explains why the events in 2008's Cloverfield occurred. 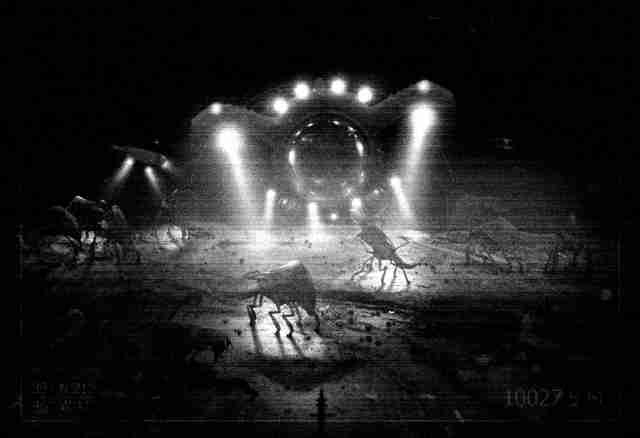 The triggering event seems to be the Shepard firing, which not only transported the Cloverfield station to another universe, but it rippled across ALL Cloverfield universes, causing the inciting events in all Cloverfield movies. 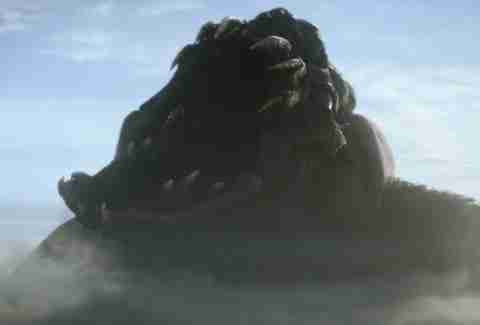 The biggest connection that this Cloverfield has to any other Cloverfield movie is the similarly designed Clover monster popping up above the cloud cover in the last shot of the film. Hamilton is back home to an Earth that she belongs in, but it's been overrun by Clover monsters. Not just any Clover monsters either: full grown Clover monsters. J.J. Abrams always said that he thought the monster from the first movie was a confused child, and that monster couldn't stick its head up through the clouds like the one at the end of The Cloverfield Paradox. The simple answer is that overloading the Shepard particle collider in space ripped holes in a bunch of universes causing crazy sci-fi stuff to happen, like demons that we mistake for sea kaiju and/or aliens. There is a more complex interpretation of this general idea: that the ripple caused by the Shepard overload moved a single egg to the Atlantic seabed in one dimension and moved aliens to another and… similar monsters to a third. Each Cloverfield movie takes place in a different dimension and sometimes those monsters are similar looking. Other times they are not. The consequences of the Cloverfield station experimenting in the future are ripples of plot convenience through time, with a Japanese umbrella corporation (not THE UMBRELLA corporation - different franchise… for now) being the only thing tying all Cloververses together. What's in store for Cloverfield 4? Nazis. If you believe the online rumors (and why wouldn't you, you just got to stream The Cloverfiled Paradox hours after learning it existed; anything is possible), the fourth Cloverfield entry has already completed principle photography and will reportedly be set during World War II, with Nazis experimenting on... something that will probably be named "Cloverfield" for reasons of convenience. We could see it as early as October. Dave Gonzales is a pop-culture writer and podcaster. He drinks one Slusho every morning. Follow him @da7e.